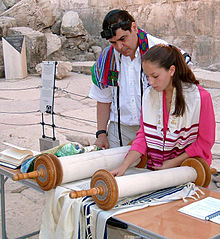 ^ "Origins of the Bar/Bat Mitzvah". ReformJudaism.org. October 19, 2012. ^ Bazelon, Emily (May 19, 2005). "Saving the Bar Mitzvah". Slate. Archived from the original on October 13, 2007. Retrieved October 5, 2007. ^ Machzor Vitri on Pirkei Avot, also found at Machzor Vitry מחזור ויטרי (in Hebrew). p. 549. Retrieved March 7, 2018. Marcus Jastrow; Kaufmann Kohler (1901–1906). "Bar Miẓwah". In Singer, Isidore; et al. (eds.). The Jewish Encyclopedia. New York: Funk & Wagnalls. 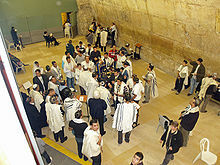 ^ "History of the Bar Mizvah". Jewish Encyclopedia. Retrieved April 13, 2013. 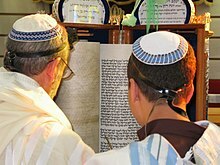 ^ "Some Laws of Tefillin – The Basic Laws and the order of Putting on the Tefillin". Chabad.org. Retrieved August 13, 2012. ^ a b c d e f g h Doll, Jen (December 9, 2017). "The Bar Mitzvah Party Starters". Topic. Retrieved December 23, 2017. ^ Cohen, Stefanie (April 18, 2010). "$1 Million Parties – Have NYC Bar Mitzvahs Gone Too Far?". New York Post. Archived from the original on April 20, 2010. Retrieved April 18, 2010. ^ Al (January 18, 2011). 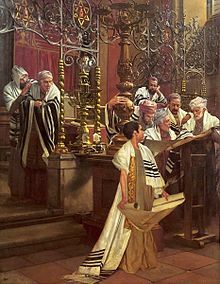 "Saturday Night Live Mocks Over-The-Top Bar Mitzvah". Jewish Humor Central. Retrieved August 13, 2012. ^ Allison Hoffman (December 9, 2007). "Big bucks and pink thrones". The Chicago Jewish News. Archived from the original on November 20, 2012. Retrieved August 13, 2012. ^ Barkat, Amiram (May 27, 2003). "Coming of age a little later than usual". Haaretz. Retrieved April 13, 2013. ^ a b "The First American Bat Mitvah". Jewish Virtual Library. March 18, 1922. Retrieved April 13, 2013. ^ Waskow, Arthur Ocean and Phyllis Ocean Berman. Excerpt from A Time for Every Purpose Under Heaven Farrar, Straus and Giroux, LLC at "History of Bat Mizvah". Archived from the original on October 13, 2007. Retrieved October 10, 2007.